Trainer Sandy Thomson expressed his satisfaction after stable star Seeyouatmidnight was allotted 10st 8lb for the Randox Health Grand National. The 10-year-old has been sidelined by injury since finishing second over hurdles at Kelso last March, but is undoubtedly a contender for the Aintree spectacular on his best form. On his penultimate run over fences, he dominated Bristol De Mai in the Colin Parker Memorial Chase at Carlisle and had this year's Grand National favourite Blaklion behind him when landing the Dipper Novices' Chase at Cheltenham on New Year's Day 2016. Thomson said: "I hoped he might be rated 150 so to get 149, I'm very pleased. "We're delighted with where we are at the moment. He seems very well and we're aiming for either the Premier Chase at Kelso or the Grimthorpe Chase at Doncaster, which are both on March 3. "He has to run in a chase to qualify, so he'll probably go for one of those. We'll give him an entry in the three-mile handicap at Cheltenham (Ultima Handicap Chase), but that would be a big ask on his first run. "Hopefully we'll get a run in, possibly at Kelso, and all roads will lead to Aintree then. "Blaklion will definitely run in the National so whatever happens, our horse will carry less than 11 stone and I always think if you're under 11 stone in these long-distance handicap chases, you're pretty well-in." 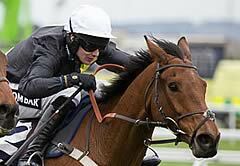 Seeyouatmidnight is as short as 33-1 for the Grand National on April 14.